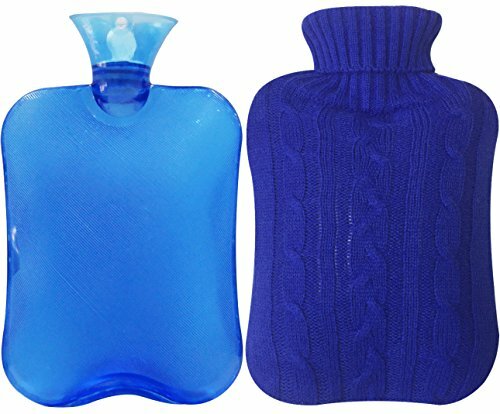 Attmu Classic Rubber Transparent Hot Water Bottle 2 Liter with Knit Cover - Blue * About the product - Can't sleep on a cold night? A cozy hot water bottle will work its magic. - Cold Feet? Hot water bottles keep your feet warm and comfortable. - Hot water bottles soothe and calm children. - Hot water bottle can be used alone as a remedy for aches, pains and sports injuries. - A hot water bottle is a time-honored method of treating sore muscles, stress or cramps, arthritis, aches and pains, stiff necks, lower back pain, menstrual cramps and other common aches and stresses of everyday living. 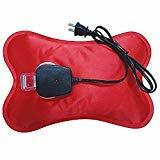 - Hot water bottles are easy to travel with, especially on a long flight or bus ride. - This hot water bottle holds the heat longer than traditional rubber bottles. - Comes with an elegant knitted water bottle cover to prevent the hot rubber from being in direct contact with your skin to cause burns, plus it has a more classy and personalized look. - As with the knit cover, you may not feel very hot. If you like hot feel, please remove the cover to get more heat. - Also works as an ice pack. * Package Include: 1 x hot water bottle + 1 x knit cover, blue * Note Please - Not suitable for children under the age of 36 months. - Bottles should be replaced after two years of use. - Do not heat in a microwave oven. - Hot water bottle can cause burns avoid prolonged direct contact to skin. * About Attmu We promise to offer good quality products to make you satisfied. We make every effort to provide quality services. Please contact our customer service if there's any question. Not satisfied? Please don't worry, return of goods is 100% guaranteed. MULTI FUNCTIONAL HOT WATER BOTTLE: Thermoplastic material that is odorless and recyclable. Advanced thermoplastic holds heat longer than traditional rubber bottles, also works as an ice pack, or cold water bottle. But please CAUTION: The hot water bottle is not suitable for Microwave oven heating. EASY TO USE- Wide mouth is easy to fill and the anti spurt lip prevent water spitting back out like those old rubber ones. Fill only to two-thirds capacity maximum. It's transparent. No more guesswork about how much hot water is inside. 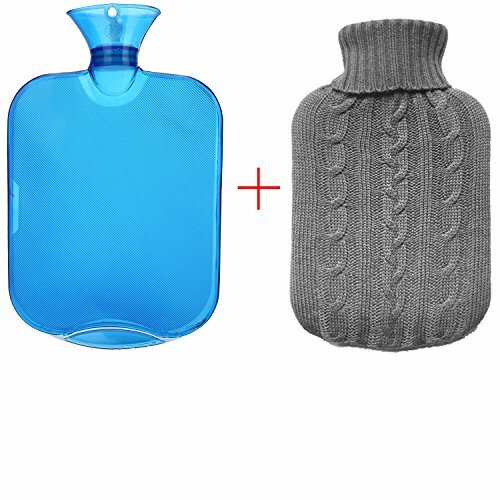 HomeTop 2 Liter Hot Water Bottle is a natural way to quickly warm up and relieve stress and muscle pain. 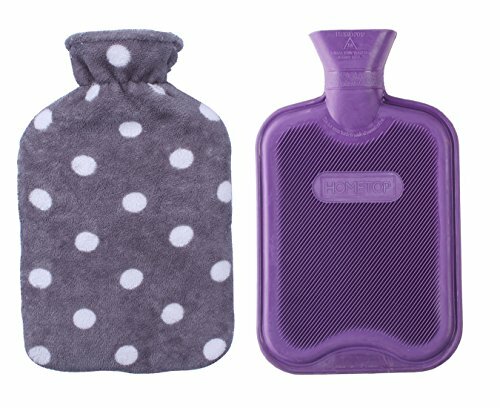 Keep warm and cosy on those long, cold winter nights with one of these fabulous hot water bottles. The hot water bottle is made from natural rubber and conforms to British Standard 1970:2012. CARE INSTRUCTIONS To ensure maximum life from the hot water bottle please read the following: When filling the hot water bottle, DO NOT USE BOILING WATER. This may damage the rubber. Fill only to two-thirds capacity maximum. When filling, hold the bottle in an upright position and fill slowly to avoid the hot water splashing back. Before use, allow up to 20 minutes for the bottle to reach its maximum temperature. Prevent contact with hot surfaces. IMPORTANT Not suitable for children under the age of 36 months. Handing should always be carried out by an adult. Check stopper for wear and tear damage at regular intervals. Bottles should be replaced after two years of use. Hot water bottle can cause burns - avoid prolonged direct contact to skin. Please clicking our storefront link next to the title on the top for more sizes, style and combo options. Online lowest price from direct factory with great saving. GREAT FOR PAIN RELIEF, HOT & COLD THERAPY - Hot water bottle can be used alone as a remedy for aches, pains and sports injuries. In addition to the traditional hot therapy, it can also double up as a cold compress for kids with fever or to reduce swelling for minor injuries. CONTINUOUS WARM - It is made from natural rubber. Retains heat for an extra long time. Ribbed outer surface helps maintain liquid temperature. GREAT GIFT CHOICE - The perfect Birthday or Holiday gift for friends and family, ideal for keeping you cosy at night or quick pain relief. LIFETIME GUARANTEE - With HomeTop, you're taking no risk with your purchase. If you're not thrilled with your purchase for any reason, just tell us and we will do our best to give you the most satisfactory solution. Find our HomeTop storefront for more styles and other deals that are waiting for you! About the product - Can't sleep on a cold night? A cozy hot water bottle will work its magic. - Cold Feet? Hot water bottles keep your feet warm and comfortable. - Hot water bottles soothe and calm children. - Hot water bottle can be used alone as a remedy for aches, pains and sports injuries. - A hot water bottle is a time-honored method of treating sore muscles, stress or cramps, arthritis, aches and pains, stiff necks, lower back pain, menstrual cramps and other common aches and stresses of everyday living. - Hot water bottles are easy to travel with, especially on a long flight or bus ride. 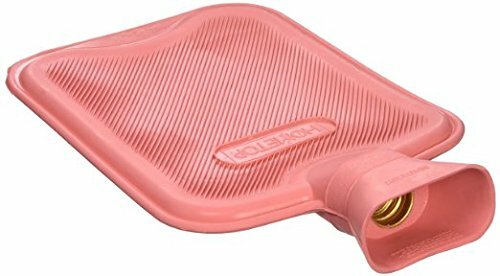 - This hot water bottle holds the heat longer than traditional rubber bottles. - Also works as an ice pack. Note - Not suitable for children under the age of 36 months. - Bottles should be replaced after two years of use. - Hot water bottle can cause burns avoid prolonged direct contact to skin. CARE INSTRUCTION- Grid texture makes skin contact safer and more comfortable. Hot water bottle can cause burns (avoid prolonged direct contact to skin). The bottles should be replaced after two years of use. And check stopper for wear and tear damage at regular intervals. 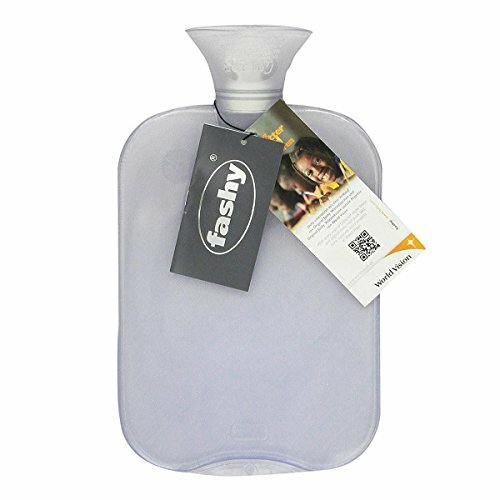 Samply Transparent PVC Hot Water Bottle with Knitted Cover 0.5L /1 L / 2 LCaution : Fill only to two-thirds capacity maximum.About the product :1. Great bottle for cold night which can't sleep2. Keep your feet warm3. Can be used for remedy for aches, pains and sports injuries.4. 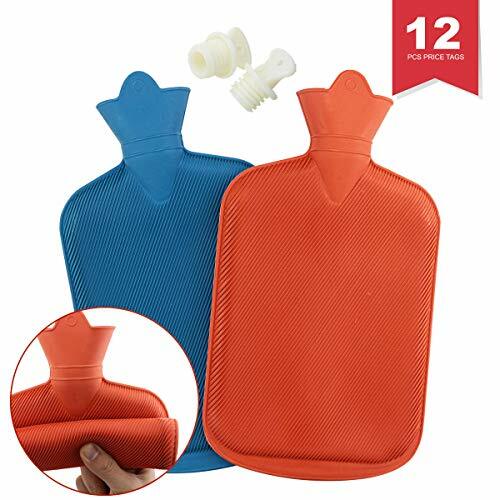 It also can be used as an ice packPackage Include:1* hot water bottle1* knit cover About SamplyAs a manufacturer of hot water bottle for over ten years, we offer 100% no risk money-back guarantee. If you're not thrilled with your purchase for any reason, just tell us and we will do our best to give you the most satisfactory solution. ANTI-LEAK DESIGN: Wide mouth for easy fill, so that it is you can fill the water bottle more easily. Reduce the risk of burns by hot water. LIFETIME GUARANTEE - With Samply, you're taking no risk with your purchase. We offer 100% no risk money-back guarantee. If you're not thrilled with your purchase for any reason, just tell us and we will do our best to give you the most satisfactory solution. 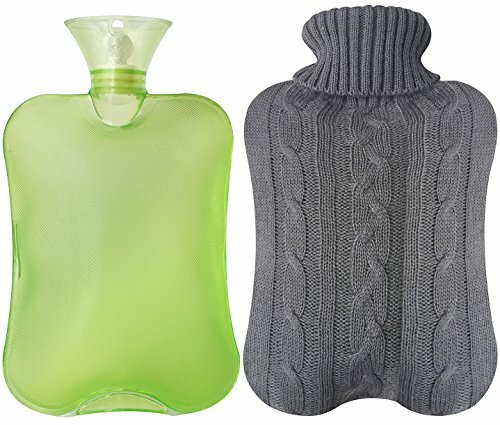 Attmu Classic Rubber Transparent Hot Water Bottle 2 Liter with Knit Cover - Green * About the product - Can't sleep on a cold night? A cozy hot water bottle will work its magic. - Cold Feet? Hot water bottles keep your feet warm and comfortable. - Hot water bottles soothe and calm children. - Hot water bottle can be used alone as a remedy for aches, pains and sports injuries. - A hot water bottle is a time-honored method of treating sore muscles, stress or cramps, arthritis, aches and pains, stiff necks, lower back pain, menstrual cramps and other common aches and stresses of everyday living. - Hot water bottles are easy to travel with, especially on a long flight or bus ride. - This hot water bottle holds the heat longer than traditional rubber bottles. - Comes with an elegant knitted water bottle cover to prevent the hot rubber from being in direct contact with your skin to cause burns, plus it has a more classy and personalized look. - As with the knit cover, you may not feel very hot. If you like hot feel, please remove the cover to get more heat. - Also works as an ice pack. * Package Include: 1 x hot water bottle, green + 1 x knit cover, grey * Note Please - Not suitable for children under the age of 36 months. - Bottles should be replaced after two years of use. - Do not heat in a microwave oven. - Hot water bottle can cause burns avoid prolonged direct contact to skin. * About Attmu We promise to offer good quality products to make you satisfied. We make every effort to provide quality services. Please contact our customer service if there's any question. Not satisfied? Please don't worry, return of goods is 100% guaranteed. - This hot water bottle is manufactured to B.S.1970:2012 to ensure maximum safety. - It is made from natural rubber, some rubber smell is normal, just put it in a ventilated environment for few days, the smell will disappear. - The classic design of this classic home remedy, made of thermo-plastic material, this hot water bottle is the perfect treatment for aching muscles, pains and sports injuries. - The heat of hot water bottle can keep more than 6 hours if you use it in blanket or quilt. It always depends on the environment you use it. - As with the plush cover, you may not feel very hot. If you like hot feel, please remove the cover to get more heat. When filling the hot water bottle, DO NOT USE BOILING WATER. This may damage the rubber. Fill only to two-thirds capacity maximum. When filling, hold the bottle in an upright position and fill slowly to avoid the hot water splashing back. Before use, allow up to 20 minutes for the bottle to reach its maximum temperature. Prevent contact with hot surfaces. Bottles should be replaced after two years of use. Hot water bottle can cause burns - avoid prolonged direct contact to skin. Please clicking our storefront link next to the title on the top for more sizes, style and combo options. Online lowest price from direct factory with great saving. Classic hot water bottle that is superior to other hot water bottles on the market! Of course, it is still same practical for home remedy. This hot water bottle is manufactured to B.S.1970:2012 to ensure maximum safety. It is made from natural rubber. When filling the hot water bottle,DO NOT USE BOILING WATER.This may damage the rubber. Fill only to two-thirds capacity maximum.When filling,hold the bottle in an upright position and fill slowly to avoid the hot water splashing back. Before use, allow up to 20 minutes for the bottle to reach its maximum temperature.Prevent contact with hot surfaces. Handing should always be carried out buy an adult. Made of 100% BPA-free food-grade silicone, que Bottle is 100% plastic-free, making it safe for people and the planet. Unlike metal or plastic containers, silicone WILL NOT change the taste of your water. It's the water bottle that has the best qualities of glass and metal, with the added benefit of being flexible, light, and shatter resistant. 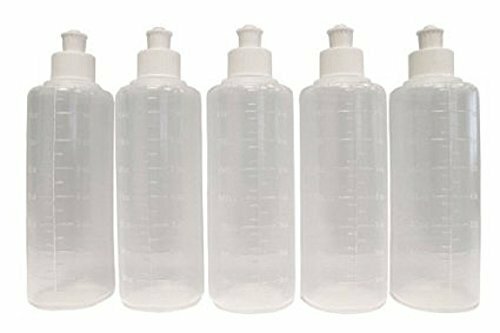 que Bottle is lightweight and compact, taste and odor free, stain and bacteria resistant, dishwasher safe, and leakproof. Plus, we are offering two size: high-capacity 20 fl oz for everyday use and 12 fl oz bottle for travelers and kids. Collapsed que Bottle can be used as a small-sized bottle, making it even more versatile. que Bottles are the only collapsible water bottles that are functional and fashionable. Its unique spiral design compresses bottles into half size without compromising the good looks. que Bottles can easily fit into virtually any bags, making them perfect for traveling, outdoors and everyday life. SAFE: 100% FDA & LFGB approved food-grade silicone and 100% plastic-free making it safe as well as taste and odor free! Safe for both cold and hot beverages, safe for hot liquids up to 450 F (230 C). No burning, no melting. But we do not recommend using it for liquid temperatures higher than 140 F (60 C) to avoid burning your hand while holding it. SOOTHING HEAT THERAPY: The Happy Heat Heated Water Bottle uses heat to assist and soothe rheumatoid arthritis, menstrual cramps, lower and upper back pain, sore muscles, muscle spasm, stiff neck pain, stress, common aches, soreness, and cramps by applying state-of-the-art innovation to the traditional hot water bottle. NATURAL REMEDY: Our rechargeable heating pad is well suited for those who suffer from debilitating chronic pain, are recovering from surgery, are sore from prolonged hours sitting in front of their desk or in their car, or are simply experiencing cold feet in the dead of winter. You can even bring it to your office to warm up in the early morning while the heater is just starting up. SAFE FOR MEN, WOMEN & KIDS: Our new generation portable hot water bottle includes a safe, built-in auto shut-off function to prevent overheating. We use high-quality materials to manufacture this rechargeable heating bottle to prevent leaking. The removable cover offers additional insulation to prevent direct exposure of skin to high temperature, guaranteeing a comfortable night time rest. EASY TO USE: Just plug in to an outlet - no microwave, no boiling water, no refill necessary. Our devices charge in 12 to 15 minutes and heat water from 140 F to 158 F in less than 15 minutes. They can stay hot for 45 minutes to 1 hour and can stay warm for 4 to 5 hours (an entire night) when covered or more than 2 hours in a cold room. CARE INSTRUCTION: Our low-maintenance heating pad comes with a soft and washable cover to help keep the electric water bottle warm for longer. The cover has a drawstring tie allowing for easy access. For your safety and protection, please do not use the hot water bottle while it is charging to avoid shock. Brand: Happy Heat | Manufacturer: CCV Inc. Need water in a hurry? 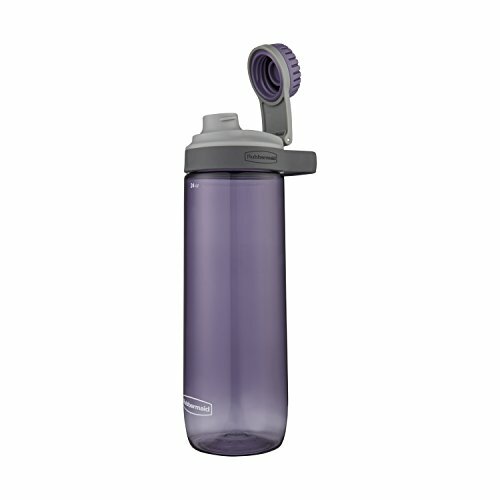 grab the Rubbermaid leak-proof Chug water bottle, unscrew the protective spout cover, and Hydrate. The wide mouth is perfect for chugging or adding ice cubes. The lid is leak-proof when closed and features a convenient carry loop, so you can take the Chug water bottle with you on the go and not worry about spills. Constructed of BPA-free Tritan plastic, this reusable water bottle is stain- and odor-resistant, and it's top-rack dishwasher safe for a quick, easy clean. It is made from natural rubber. Retains heat for an extra long time. Ribbed outer surface helps maintain liquid temperature. Hot water bottle can be used alone as a remedy for aches, pains and sports injuries. In addition to the traditional hot therapy, it can also double up as a cold compress for kids with fever or to reduce swelling for minor injuries. We offer no risk money-back guarantee. 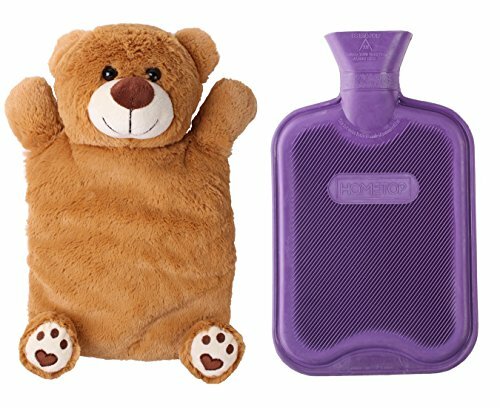 The Carex Hot Water Bottle with Fleece cover is a natural hot pack way to quickly warm up and relieve stress and muscle pain. The water bottle can be filled with hot or cold water and the fleece cover provides a comfortable fuzzy surface. Use the Hot Water Bottle with Fleece cover to keep warm in bed by placing by your feet or up by your body. Relieves muscle tension or menstrual cramping. The water bottle can also be filled with cold water to sooth aches and pains or to cool your body down and reduce hot flashes. 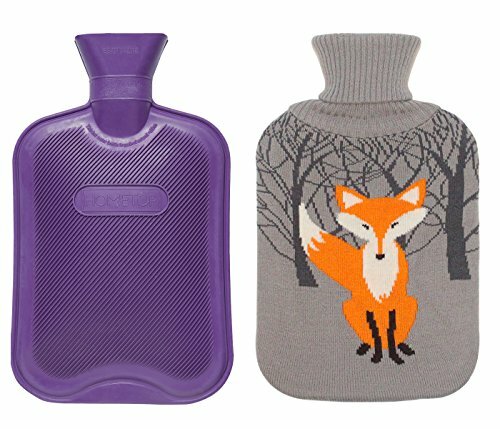 Looking for hot water bottles to keep you warm or relieve pain? You found it with the Carex hot water bottle with cover. Cover is made of fleece. 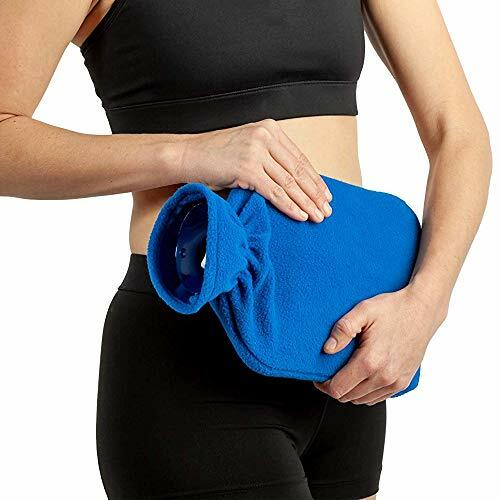 HOT WATER BOTTLE: With a soft fleece cover this hot water bottle with cover offers comforting warmth for warming up cold hands & feet adding warmth to your bed & relieving pain like sore muscles, menstrual cramps or joint pain from arthritis. RELIEVE YOUR PAIN: Heat therapy especially moist heat can help manage chronic pain or help tight stiff muscles relax. It can offer relief for pain like chronic back pain neck pain muscle soreness or spasm and joint pain like arthritis or fibromyalgia. WARM YOURSELF UP: The water bottle can be filled with hot or cold water and the fleece cover provides a comfortable fuzzy surface. Use the Hot Water Bottle with Fleece cover to keep warm in bed by placing by your feet or up by your body. HEAT THERAPY OR COLD THERAPY: Whether you are recovering from surgery or illness have strains or sore muscles need to manage chronic pain headaches PMS or PMDD or are looking to be warm & cozy Carex hot & cold therapy products have you covered. TRUST CAREX, a leader in heat therapy products, especially products that provide pain relief from menstrual cramps, arthritis, the flu, or general muscle pain. This hot water bottle is manufactured to B.S.1970:2012 to ensure maximum safety. It is made from natural rubber, some rubber smell is normal, just put it in a ventilated environment for few days, the smell will disappear. The classic design of this classic home remedy, made of thermo-plastic material, this hot water bottle is the perfect treatment for aching muscles, pains and sports injuries. The heat of hot water bottle can keep more than 6 hours if you use it in blanket or quilt. It always depends on the environment you use it. As with the knit cover, you may not feel very hot. If you like hot feel, please remove the cover to get more heat. 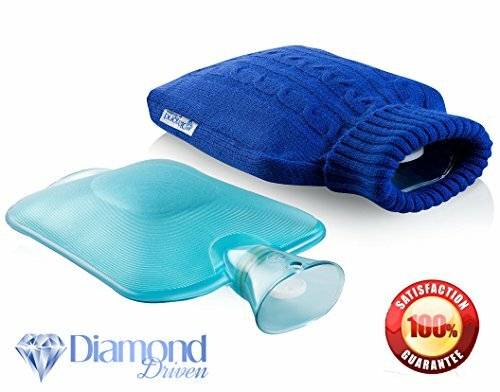 Click 'Add to Cart' to get this Top Quality Large Hot Water Bottle with Blue Knit Cover and get the relaxing relief you deserve. 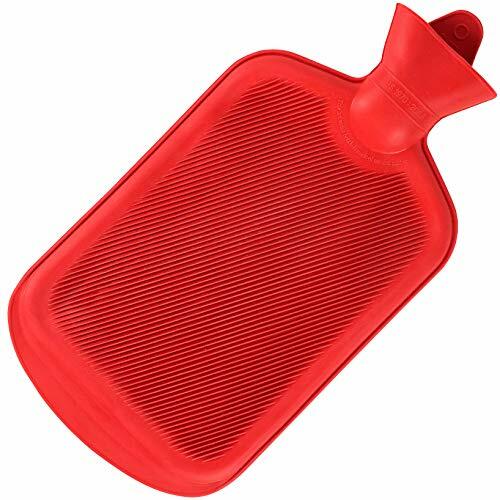 MULTI-USE OF HOT WATER BOTTLE: This old-fashioned hot and cold water bottle can be molded to any part of your body to get the heat exactly where it needs. This Advanced thermoplastic holds heat for a longer time to keep water hot and cold. Hot water bottle can be used alone as a remedy for aches, pains, and sports injuries. EASY TO USE: Wide mouth allows you to fill easily water inside & anti spurt lip prevents water spitting back out like those old rubber ones. Fill only to the two-thirds capacity maximum. It's transparent so, no more guesswork about how much water inside the bottle. Helps relax your tired muscles and tensed shoulders caused by too much stress and intense workout and can also double up as a cold compress for kids with fever or to reduce swelling for minor injuries. BEST ASSISTANT: The best advantage to use this bottle is improve blood flow which eases the menstrual pain for a lighter and relaxed feel. The classic design of bottle helps to stress or cramps, arthritis, aches and pains, stiff necks, lower back pain, menstrual cramps and other common aches and can also double up as a cold compress for kids with fever or to reduce swelling for minor injuries. CARE INSTRUCTION: Grid texture makes skin contact safer and more comfortable. Hot water bottle can cause burns (avoid prolonged direct contact with the skin). The bottles should be replaced after two years of use. And check stopper for wear and tear damage at regular intervals. This hot water bottle is manufactured to B.S.1970:2012 to ensure maximum safety. 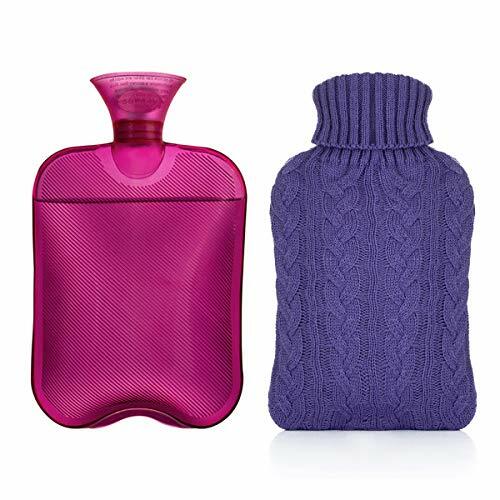 ELEGANT KNITTED COVER & VERSATILE PAIN RELIEF THERMOTHERAPY: Our Hot water bottle available with knitted water cover to prevent the hot rubber from being in direct contact with your skin, plus it has more classy and personalized look. 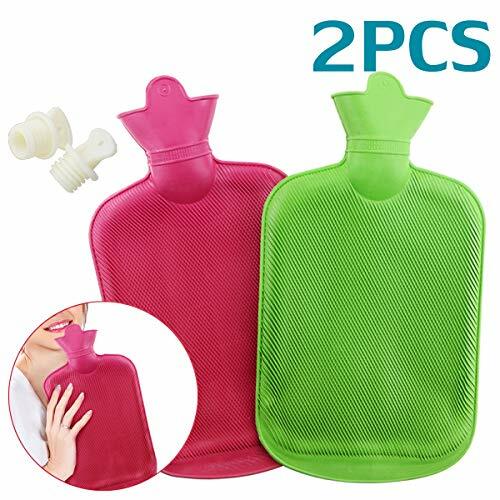 Size 7.2''x12'' ,2 L Heavy Duty Hot Water Bottle Bag, Durable and Long lasting.Ribbed Outer Surface for Safer Skin Contact and Longer Heat Retaining. - The classic design of this classic home remedy, made of thermo-plastic material, this hot water bottle is the perfect treatment for aching muscles. - The heat of hot water bottle can keep about 6 hours if you use it in blanket or quilt. If you use it outdoors, it may keep warm for only 2 hours or less. It always depends on the environment you use it. - Hot water bottle can be used alone as a remedy for aches, pains and sports injuries. It is made from natural rubber. Retains heat for an extra long time. This lovable hot water bottle & cover will keep you warm for a whole night. Hot water bottle can be used alone as a remedy for aches, pains and sports injuries. This bottle can also be used for cold purposes, allow easy filling of cold water and crushed ice. A soft and cuddly stuffed animal cover. Machine Washable. Magic tape closure makes it easy to put on bottle.